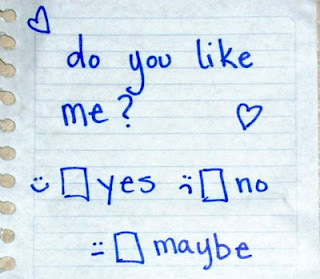 When I was in grade school it was not uncommon for little girls to pass notes to little boys that said, “Do you like me?” Underneath were two boxes, one labeled, “Yes,” one labeled, “No.” Oh, the elation if the “Yes” box was checked. And the devastation if “No” was selected. 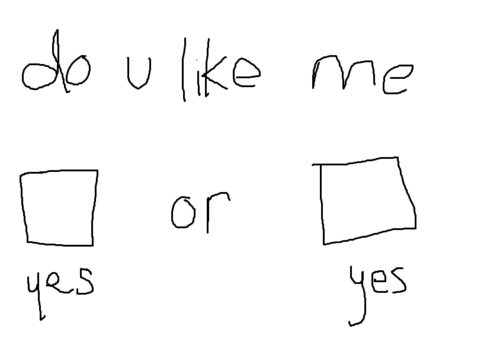 Or, even worse, if the note was crumpled in a male fist and no response received. To a new blogger the world of blogging can be a bit like that. Don’t get me wrong. Ultimately, I started this blog for me. And continue to blog for me. Though I do very much appreciate my readers and find myself unusually excited when I acquire a new follower. Or somebody likes an article. Or someone comments. I currently have 29 bright, shiny WordPress followers and 6 email followers. And they’re not all family and friends. That’s pretty cool. Then I go onto other blogs, who have elected to show how many followers they have, and I see 125….500….thousands! And I experience blog envy. I want 100 followers. I want to be one of the cool kids. The liked kids. “Really?” says the grown woman to the 4th grader within. “You’re going there?” Apparently so. Maybe I’m just crazy. Maybe I’m just a crazy chick with a streak of 4th grader in me. Aiyeeeee!!! I forgot there was usually a “maybe” option! Or is this how it’s done today? Remember the game MASH??? I’d play that with my girlfriends and it would predict the future for us!